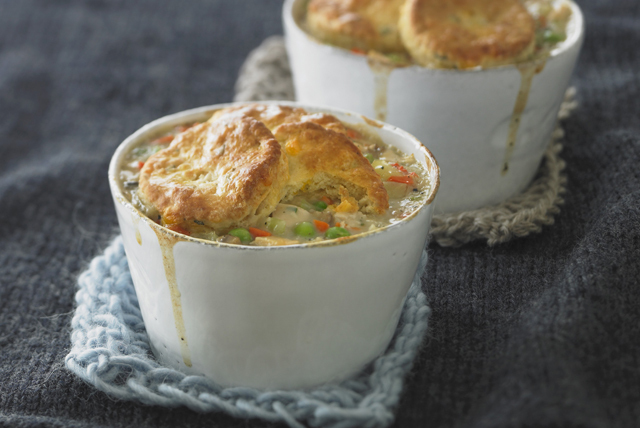 These delicious chicken pot pies are perfect for a cozy night in for two. Rotisserie chicken and all-purpose baking mix are great shortcuts for preparing these easy-to-make pot pies. Why wait? Try them tonight. Combine cream cheese product and dressing in medium bowl; stir in chicken and vegetables. Spoon into 2 (250-mL) ramekins sprayed with cooking spray. Mix baking mix and milk just until blended; knead on lightly floured surface 4 to 5 times or until dough is no longer sticky. Roll out dough to 1/4-inch thickness. Use 2-inch pastry cutter to cut dough into 4 rounds, rerolling scraps as necessary. Place 2 dough rounds over chicken mixture in each ramekin. Bake 15 to 18 min. or until biscuits are golden brown and filling is hot and bubbly. Stir 2 Tbsp. chopped fresh basil into chicken mixture before spooning into prepared ramekins as directed. For added convenience, the chicken mixture can be prepared ahead of time. Refrigerate up to 12 hours before spooning into prepared ramekins, topping with dough rounds and baking as directed.